Explanations: Test tire is pressed to roller using old mileage car frame and weight. The roller is drived by motor. The surface of roller is much like the surface of road. 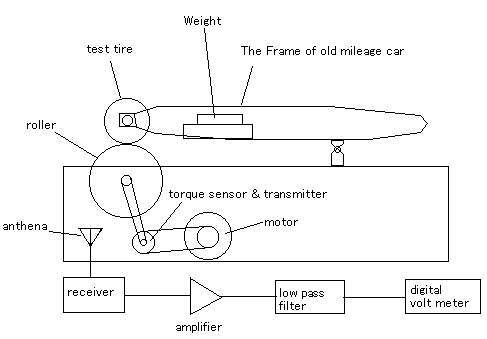 The torque to drive the roller is measured using telemetly system. The signal of torque is readed by digital volt meter. 2.Without test tire,read the value V1 of digital volt meter. 3.With test tire,read the value V2 of digital volt meter. 4.Without test tire,read the value V3 of digital volt meter. 5.Estimate the changing value V as follows,V=((V2-V1)+(V2-V3))/2. 6.Estimate the rolling resistance of test tire with calibrating prosses.